ERI was represented at a recent forum in Rome which looked at how Catholic-inspired organizations, can better protect and promote the human person in a rapidly changing world. Over 100 organisations were represented, ranging from groups focused on peace, immigration, education, development and pro-life issues. 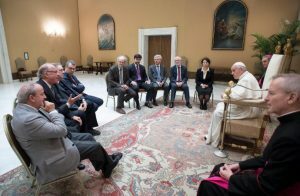 They were joined by academics, Vatican officials and observers or representatives of the Holy See to international agencies in Paris, New York and Rome. Addressing the forum, Archbishop Paul Gallagher urged Catholic-inspired NGOs to work together to achieve “the ideal of human fraternity and a means for its greater realisation.” While encouraging a balance between a spirit of collaboration and respect of autonomy of action with the Holy See, he stressed that the members and leaders of the NGOs are the real protagonists, since they bring “real life experiences and expertise” to the table through their work. He went on to identify some of the areas, initiatives and priorities, where combined efforts can prove to be beneficial. These included the 2030 Agenda for Sustainable Development which he noted provided “an action plan for people, the planet and prosperity”, “determined to end poverty and hunger, in all its forms and dimensions”, and to ensure “that all human beings can realize their potential in dignity and equality and in a healthy environment” and to “leave no one behind”. He further highlighted the issues of migration, education, climate change, (including the need for NGOs to monitor National Determined Contributions agreed to in Paris) and respect for and promotion of Human Rights, especially the right to life ‘from conception to natural death’ which applied to issues regarding the unborn, migrants, the elderly and capital punishment, and freedom of religion and belief.